In August of 2008 Amanda returned home from a summer visit to see her friend Darci in New Jersey with a couple of new found "friends" named Evra and Verde. 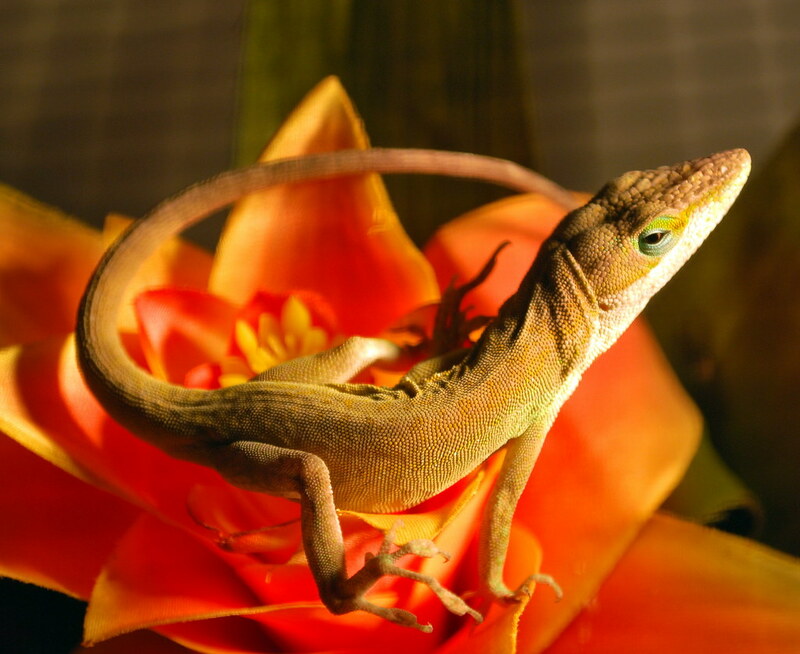 These friends were actually Carolina anole lizards which are sometimes referred to as the American chameleon due to its color-changing abilities. 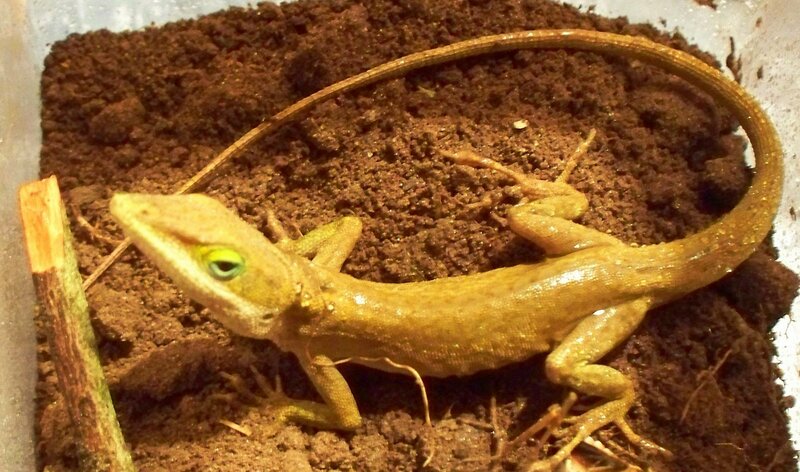 When an anole is happy it can turn several different shades of green but it's color will be brown if stressed or ill - something that I became quite aware of as Amanda's anoles became part of the family. When she first brought them home, Verde refused to have her picture taken but Evra didn't seem to mind at all and even seemed to enjoy striking the occasional pose for me. 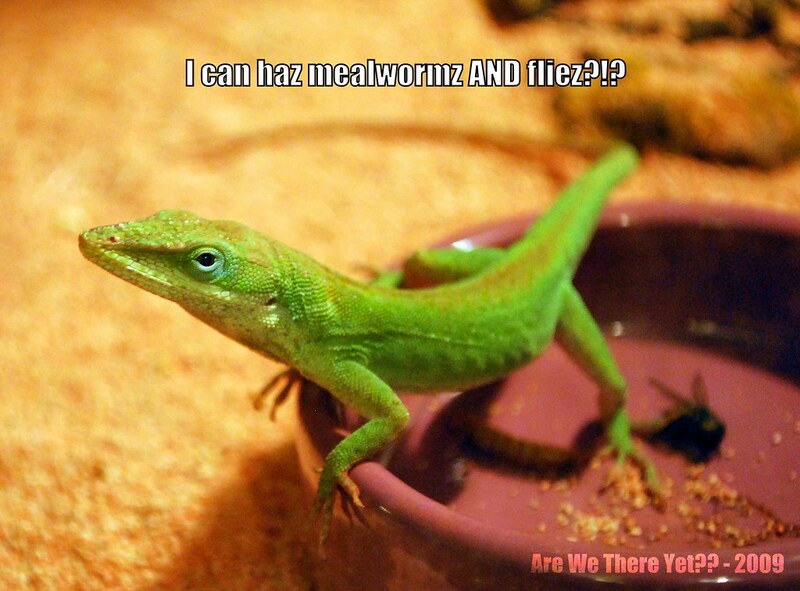 Verde died about two months after Amanda got her and shortly after that Amanda became much more interested in her corn snake, Solaris, so that made Evra more or less my lizard by default. All things considered, I didn't really mind as I rather enjoyed talking to the little guy and he was easy enough to take care of - mist down the habitat, make sure the heating lamp didn't burn out, and feed him some juicy mealworms once in awhile. Very simple - very easy. When we moved at the end of January this year to our new place, I wasn't too sure how Evra would adjust but he really took to his new surroundings and was more often a happy shade of green than stressed-out brown. He esepcially seemed to like it when I would go outside and stun flies so that I culd then bring them in and let him get a little exercise before he'd catch them and eat them. I'd read somewhere that it was good to do that sort of thing once in awhile and even though just stunning a fly rather than killing it wasn't easy I was able to bring him a treat from time to time. He usually rewarded me for my efforts by turning green and posing for pictures afterward! Recently I had noticed that Evra seemed to moving a lot slower than before and I started to get a little worried that he didn't seem to be eating too many of his worms. It had turned kind of cold so I wondered if that was the probelm; Amanda told me that lizards do slow down and almost go into hibernation in the winter months. They're tropical so I guess that makes sense but I had Amanda hook up the undertank heating pad anyway just in case Evra was feeling the effects of the colder temperatures. After that, he seemed to perk back up some and was more active again. I thought that perhaps Amanda was right - that Evra had just slowed down a bit for shedding purposes or because of the colder weather - and that now that he had an additional heating source that he'd be fine but unfortunately that wasn't the case. When I got home from work Sunday night I walked over to his habitat to see how he was doing and I could tell right away that he was dead. 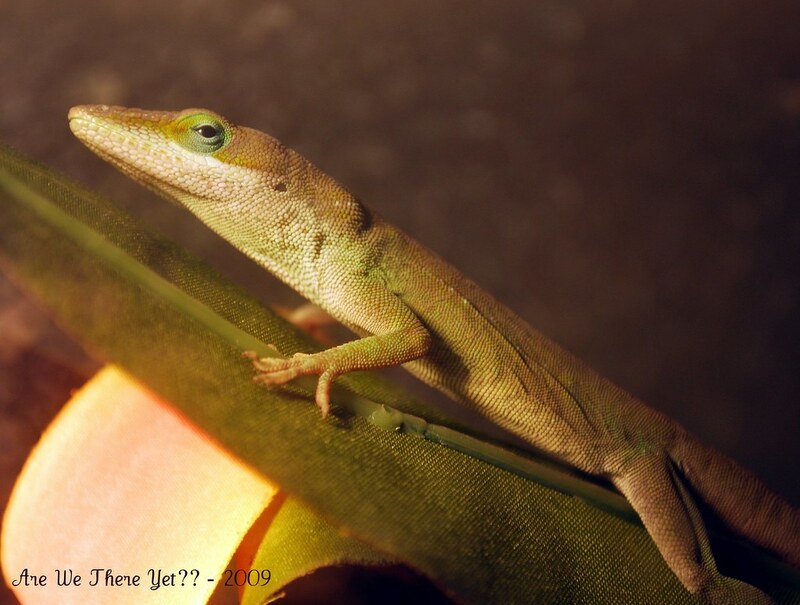 When anoles die they apparently shed every last little bit of stress as they turn a very brilliant shade of turquoise green- it's really a very pretty color but it's not one you want to see if you've grown at all attached to the creature inside that skin like I did. I found a small box and asked Amanda to put Evra in it so that I could take him out and bury him on Monday morning - which I did. I buried Evra beneath the same trees near the back of Yantic Cemetery where we had buried Amanda's second snake, Tardis, earlier this year. I figured the other residents at the cemetery wouldn't mind if a very small lizard joined them and if anyone else had wandered by they wouldn't think it at all odd that there was a woman crying in the cemetery. Good-bye, Evra - I'm not sure where lizards go when they pass on but I hope there are mealworms and flies to chase and a nice big flower to sit on in the warm sun. I'll miss you. Nothing wrong with crying over a loss. HUGS! I cried over a hermit crab. Somehow, even the littlest pets can get to our heartstrings. All of Gods creatures deserve to be loved. a pet is a family member. And Evra was a cutie pie! Hugs and sympathetic pats. A pet is a member of the family and a keeper of company and confidences. Loss and tears are totally normal reactions of empathy and you are possessed of one the worlds more empathetic hearts. I'm glad you had the pleasure and joy of taking care of Evra for a while. So sorry to hear about poor little Evra! I've felt the loss of every pet deeply, even the tiny ones like turtles and rodents. You do become attached to them and miss them when they're gone. It's nice that you found a special place for him. . . I'm sorry for your loss Linda. Although I was pretty angry about my daughter getting an Iguana, I too became attached to it. When it died, it was me who shed the tears.